RASKC, along with other pet agencies, were selected to take part in a fun, community service project held at Zulily's studios. The project was created in the hopes of raising awareness of shelter pets by donating their time and expertise to capture the pets in a softer light, namely in a home-like setting. Zulily, which provided exclusive access to their studios and creative staff, set three beautiful backdrops ranging from playful room, to the "We're going on vacation!" feel, and finally "This is home" vibe. To read more about this amazing project and the two leaders behind it all, click here. 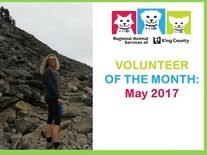 Meet Volunteer of the Month Pia Gerholt! Pia provides outstanding volunteer service as the Co-Lead of RASKC’s Kirkland Team. Since October 2015 she has juggled the schedules of more than 175 volunteers. During 2016-17 she has been the initial point of contact for about 76 new volunteers. Last year RASKC volunteers at Kirkland donated more than 5,5657 hours with Pia’s assistance and leadership. With great cheer and extraordinary diplomacy, Pia has very effectively addressed a great range of issues from assisting volunteers with using Volgistics to helping customers adopt a new furry member of their family. Since 2015 Pia and her daughter Freja have worked a regular weekly shift at Kirkland. Read a great interview with Pia on RASKC’s blog here. 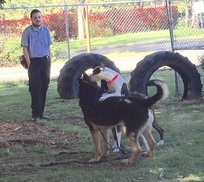 During the past few weeks RASKC led doggie playgroups for the first time. Up to six adoptable dogs were taken out to run and play with their friends, including T-Bone, Mana, Chevelle, Titus, Winston, Archie, Wilson, Dexter, and Raider. While three of these dogs had originally been identified as “not getting along with other dogs,” they actually did great together. Playgroups are a great tool to assess dogs’ behavior, as well as allowing them with the opportunity to exercise! RASKC will continue to run the playgroups as a pilot for the next several weeks with hopes of making this a standard practice within the shelter. The doggie playgroups are supervised by staff. It’s critical for all volunteers who work with cats to understand cats’ body language in order to provide better care and to deepen the bonds of friendship with feline companions. While RASKC provides a link to a great 20-minute video on the Resource Hub on the homepage of each volunteer’s online record, we wanted to also encourage you to view the online course from Maddie’s Fund here (free). While the Maddie’s Fund course will take you about 70 minutes, you don’t have to complete it all at once. You can take as many breaks as you like, leave the webpage, and turn off your computer. When you return, you’ll be asked if you’d like to resume where you left off. The Maddie’s Fund course takes you through three forms of cat communication: vocalization, body language, and scent. Throughout the course, you can test what you learn by taking min-quizzes. If you score 70% or better on the final quiz, you will earn an official certificate of attendance. We’d love to know how many RASKC volunteers achieve this distinction. If you do so, please let us know at RASKC.Volunteers@kingcounty.gov. RASKC sent foster volunteer Melissa Blake and staffer Emily Ruppert to a 10 consecutive all-day training in Auburn this month led by the internationally renowned John Rogerson. Mr. Rogerson, trainer Pat Wynn, and RASKC focus on positive reinforcement- no choke chains or angry words, for example. Focus is spent on building an emotional relationship with dogs and teaching emotional responses, with a large emphasis on non-verbal communication. You can view some of John Rogerson’s videos on YouTube. Local professional dog trainer Pat Wynn has been providing top-notch positive training and coaching for RASKC Dog Team volunteers nearly every month for the past three years at no cost. She also teaches at Seattle Humane in Bellevue. Here’s her website. Early Morning Cat Crew: The shifts will take place as usual. Cat Meet & Greet: No shifts. Vet Clinic: Volunteers: No shifts. Shelter Helper: Shifts are optional. If you take the day off, be sure to take yourself off the schedule. Dog Team: Volunteer shifts take place as usual, except the last shift of the day ends at 4pm. Because the dogs will be kenneled so early, it’s extremely important that volunteers who are scheduled for the early shift on Tuesday, May 30, arrive promptly at 8am. Foster volunteers: The Vet Clinic will be closed to fosters, except that Foster Care Coordinator Lori Mason is available by phone and text for emergencies. The theme for the Pride Parade this year: We ALL Belong Here. 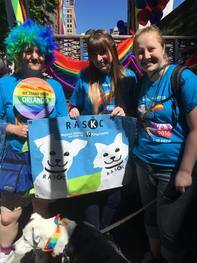 For the third consecutive year RASKC volunteers are invited to join the King County contingent on Sunday, June 25, in downtown Seattle for the annual LGBT Pride Parade. Last year more than 300 King County employees and volunteers, their families (including some dogs) and friends joined in the festivities. Dogs are welcome in the Parade. If the dog you own is well socialized, able to walk a little over a mile, and is good in crowds, feel free to bring them. You'll also need to bring water and poop bags. If the weather is very warm, be aware that hot pavement on the route could cause issues for sensitive paws. Of course, dog handlers will need to pick up any messes their pet leaves behind. Details to follow, but lineup usually begins no later than 10:00am in downtown Seattle. Muddy Mutts: Foster volunteer Melissa Blake reports that two RASKC canine alumni enjoyed a playdate at the Muddy Mutts event earlier this month. See side photo. Seattle Beerfest: Foster volunteer Melissa Blake recruited 54 volunteers, including some RASKC staffers, to help at Seattle Beer Fest on July 9. Since the event organizers will contribute $50 for each person who was registered by May 1, RASKC will receive $2,700 if everyone works their shift. Thanks to Melissa and everyone who will be participating! 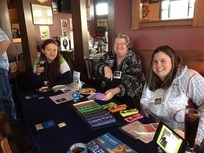 Catsino: Foster Care Coordinator Lori Mason and four volunteers worked this fundraising event last month, sponsored by the Furry Faces Foundation. Over $665 was raised for RASKC at this event. Thanks to volunteers Melissa Blake, Dawn Detwiler, Dawn Gerken, and Marie Gerken. Melissa, Marie, and Dawn are featured in the photo below. Thanks also to Starbucks (211th Street Kent location), Applebee’s (Covington), and Road Runner Sports (Kent) for donating gift certificates that contributed to RASKC’s fundraising success at this event. Much gratitude to Teri Ensley, who runs the Furry Faces Foundation. Saying Goodbye? When it comes time to say goodbye to volunteering, be sure to give your team leaders as much advance notification as possible-- at least two weeks, if possible. Please also give this type of advance notification also whenever you need to request a Leave of Absence, which is missing three or more consecutive shifts. Employer Matching Funds: RASKC recently received a check for about $550, which represented employer matching funds for their employees who volunteer for RASKC. 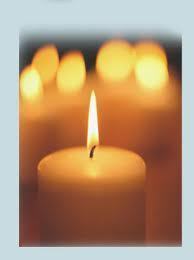 Thanks to Wendy Lin, Hiroko Yamaoka, and many others who participate in this type of program. Much gratitude also to participating employers including T-Mobile, Alaska Airlines, Amazon, and others!